First day of the new year, sun shining bright with the temp hovering at 34. I took a nice long walk on the Portage Trail while catching up with some old friends in Arizona and Texas via cellphone. I love to walk and chat with friends. It makes me feel like they are right there with me. The walk becomes so much more enjoyable. And the cold…..what cold? Of course, I dream of being on the coast in southern tropical Texas. 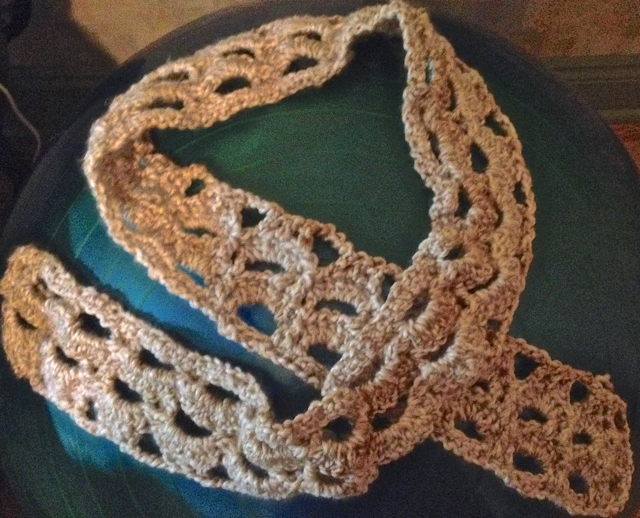 But for now I have taken up my crochet hook and started making a wonderful, soft and warm scarf to keep the winds coming off the Great Lakes at bay. My new tradition: to start creating something on the last day of the old year and complete it during the first days of the new year. Bet you have a bit warmer weather in Canby. What with all those beautiful flowers. More rain than snow? I love your motto! Happy New Year!! It is going to be pretty. Enjoy those brisk walks. Thank you, Sher! You and Barney enjoy them too! What a wonderful new tradition! Wishing a blessed new year to my one-of-a-kind friend! Right back at you, Alice. You are in my heart.